Beginning June 13th, we're opening seven genre-exclusive competitions for Country, Electronic, Francophone, Pop, Rock, Singer-Songwriter and Urban artists. Enter your smash track in the channel that best fits your music by August 25th for a chance to win great prizes and to become the 1st Annual Intel® Canada Superstar! One (1) One Intel Inspired Ultrabook valued at no less than $699 USD. One (1) Intel Inspired Ultrabook valued at no less than $699 USD. Artist must be the age of majority or older in their state or province at the time of entry and must be a legal resident of Canada. An artist may submit only one (1) unique track into each of the Intel® Canada "Superstars" Competition Channels. 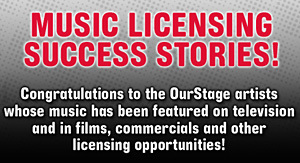 If an artist submits the same song into multiple Intel® Canada "Superstars" Competition Channels, OurStage will remove the song from the genres deemed inappropriate. Accepted genres must fall into the Country, Electronic, Francophone, Pop, Rock, Singer-Songwriter and Urban genres as defined by OurStage. All entries must be acceptable for radio airplay with clean lyrics.